8 Reasons Its Great To Be Single Again! You can go anywhere and do anything you want. You’re in charge and your life is now completely in your own hands. Whether you’re a mum, a busy career woman or both now’s the time to do things you wouldn’t normally do. Just get in the car and go somewhere out of the ordinary – something you would never have thought to do when you were with him. If you were supposed to be together, you would be. It’s a simple as that. Whether you thought he was the love of your life, or you’d been rowing for ages, if it didn’t work out then it wasn’t the right relationship for you. Fact. No more putting up with snoring, duvet-stealing, fidgeting men keeping you up at night. Learn to sleep like a starfish and enjoy that extra space. You know those times when you really just want to be quiet and watch something you want to watch on the TV without some irritating running commentary? Now you can. Your mess is your mess. And you will tidy it and then know it will stay tidy until you decide to mess it up again. No more picking up his socks and washing his vintage boxers. You’ve got all that time back and you should spend it doing something you love. Remember that annoying mate of his that you really couldn’t stand but had to suffer on a regular basis? He’s gone! And you never EVER have to see him again. Now that, is definitely something to celebrate! When you’re in a couple, you tend to spend time with other couples. It’s just the way it goes. So ring up that single friend of yours, arrange an evening out with some of her friends and hey presto, you’ve got a whole new social circle. People are scared of it, but it’s so exciting not to know what’s around the corner. You have a chance to reinvent your life from scratch, to meet someone who truly deserves you, to do things that make you smile and to have an incredible life filled with love and happiness. We’re excited about your future – it’s time you were too! 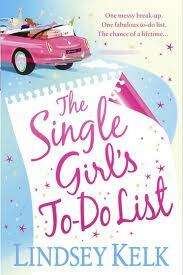 P.s Try & get hold of a copy of the ‘Single Girls To Do List’ its a fun easy read and will inspire you to embrace your single life!